Proton pada semalam melancarkan kereta global baharu, Prevé (pray-vay). Artikel penuh bakal menyusul. Sementara itu, di bawah ialah siaran rasmi media Proton Prevé. 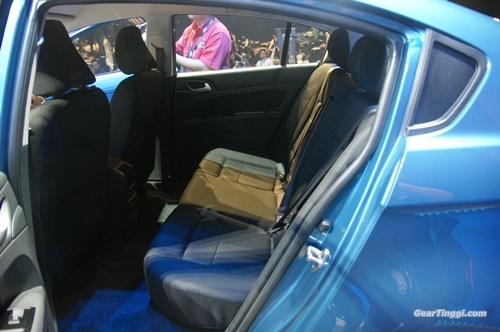 Seri Kembangan, 16 April 2012 – National car manufacturer PROTON Holdings Berhad today unveiled the Prevé, the very first of its new generation of cars built with the intention of expanding its prowess in the global market. 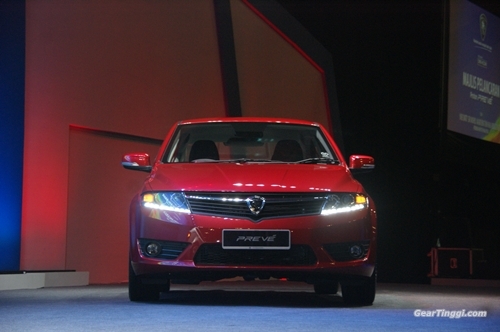 Prevé (pray-vay) is derived from the English word Preve, which means to prove or offering proof, and this is precisely what PROTON has ambitiously set out to accomplish in what is essentially its most technological advanced vehicle offered to the mass market to date. 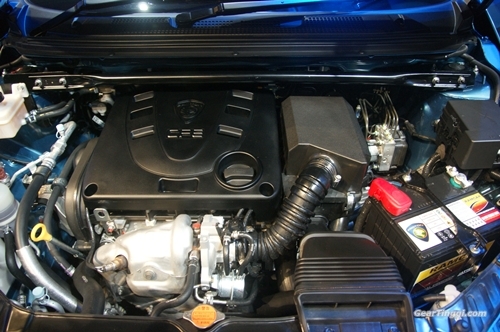 The Prevé, which is available at all authorized PROTON showrooms nationwide, is offered in three variants: the Premium with 1.6 CFE engine mated with PROTON’s 7-speed ProTronic CVT, and two Executive variants utilising the 6-speed CVT transmission, and 5-speed manual transmission – both coupled with the the IAFM+ engine. The Prevé is priced from RM72,990 on-the-road (Peninsular Malaysia) for the Premium variant, RM62,990 for the Executive CVT and RM59,990 for the Executive with manual transmission. 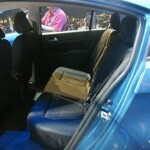 All variants come with a five-year or 150,000km warranty, whichever comes first. The vehicle was today unveiled by Prime Minister YAB Dato’ Sri Mohd Najib Tun Abdul Razak at the Mines Malaysia International Exhibition & Convention Centre. Also present were PROTON Holdings Berhad Advisor YAB Tun Dr Mahathir Mohamad, PROTON Holdings Berhad Executive Chairman Dato’ Sri Haji Mohd Khamil Jamil, and PROTON Holdings Berhad Group Managing Director Dato’ Sri Haji Syed Zainal Abidin Syed Mohamed Tahir. The launch was also attended by several Cabinet Ministers, foreign dignitaries and other distinguished guests. 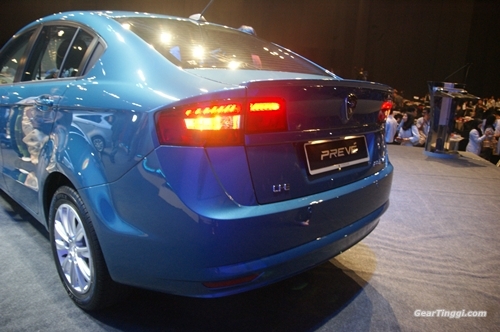 According to Dato’ Sri Haji Mohd Khamil, the Prevé represented the dawn of a new era for PROTON. 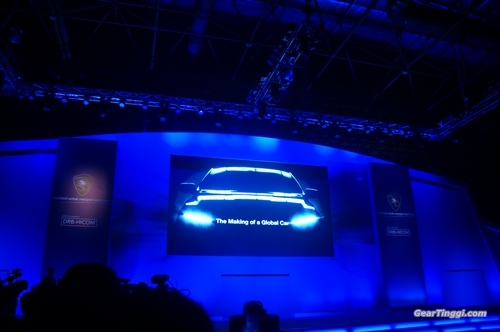 “The emphasis going forward is to emerge stronger as a global car company and at the same time redefine PROTON as both a product and brand in the realm of a rapidly evolving and highly competitive global automotive industry,” he said. 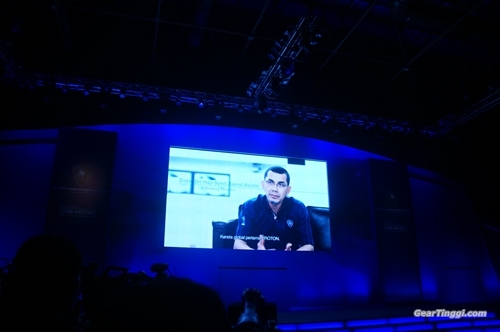 “There is already an acceptance of Proton cars regionally and globally, but we must respond more aggressively in order to expand abroad by becoming more technologically-advanced, continuing to offer customers desirable vehicles, strengthening our sales and after sales networks internationally, and to evolve stronger as a reputable, trusted, preferred and competitive car manufacturer,” he added. 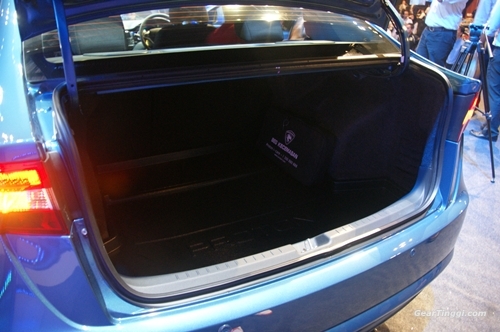 Sharing the same platform as the Exora, the Prevé was designed, engineered and built in collaboration with several world renowned parties in tandem with the desire to manufacture a global car. “With the Prevé, we have underlined this commitment and that in order to evolve to the next higher level, we also cannot exist in isolation but must be willing and forthcoming to collaborate with the world’s best. 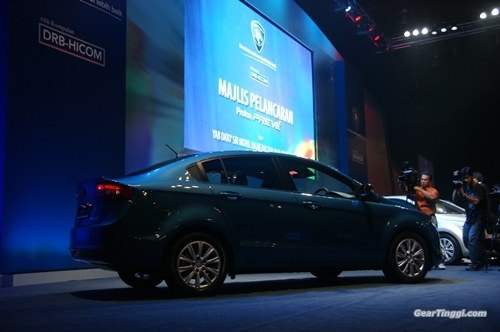 This is a new and important era for PROTON,” said Dato’ Sri Haji Mohd Khamil. 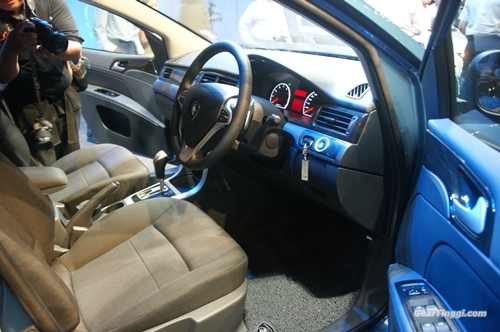 PROTON worked closely with its wholly-owned subsidiary Lotus Engineering in the area of ride and handling, while collaborating with leading global engineering and manufacturing, and design and styling companies. “The mindset and approach to conceptualizing, designing, engineering and subsequently manufacturing had carefully taken into what would be required to bring PROTON to the next level, while at the same time capitalizing on PROTON’s core areas of strength. We worked very closely with our vendors and dealers under the Early Vendor Involvement (EVI) program, to verify, confirm and finalise the overall concept design of the system and components for the Prevé. And we are proud to say that the Prevé utilizes up to 94% components sourced from local vendors,” added Dato’ Sri Haji Syed Zainal. 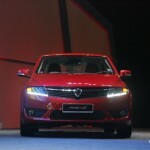 “The Prevé is proof that PROTON can engineer and manufacture world class products. “The car is a true manifestation of our commitment to be better and our promise to consumers to deliver outstanding products. 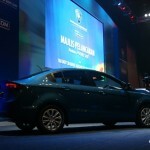 It is intended to spearhead PROTON’s foray into the global markets. 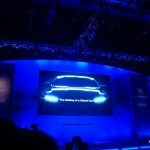 With that mission in mind, it was also important to give the vehicle a strong and fitting name that is unique and of international roots,” he said. 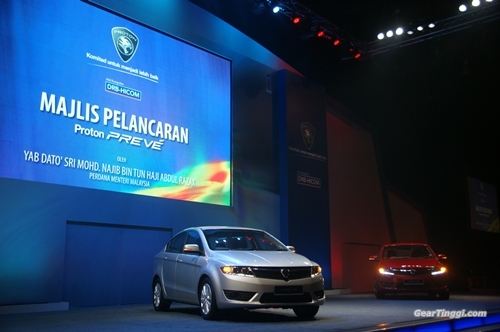 The Premium variant of the Prevé is powered by PROTON’s new generation of Charged Fuel Efficiency or CFE engine, a 1.6-litre soft turbo engine that delivers power and torque equivalent to that of larger 2.0-litre normally aspirated engines. The 1600cc power plant produces 138 brake horsepower at 5,000rpm, and with a maximum torque of 205Nm from 2,000 to 4,000rpm, offers the best acceleration for a vehicle in its class. 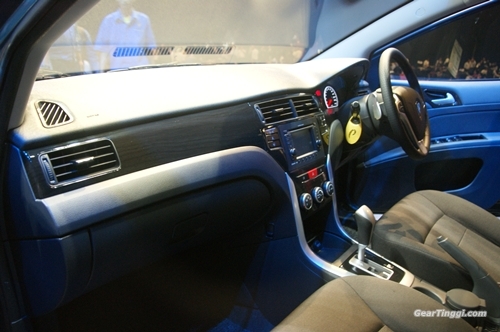 The Premium variant will also be the first in the PROTON fleet to be fitted with a 7-speed ProTronic CVT transmission equipped with steering-mounted paddle shifters for swifter gear changing. Offering seamless gear changing and renowned for its fuel economical attributes, the ProTronic CVT also incorporates a Sports “S” mode for those who enjoy a much more spirited driving. 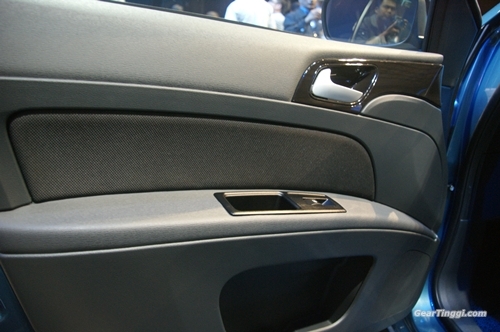 A technological first for PROTON in engineering the Prevé utilizes a technology defined as Hot Press Forming (HPF) that provides better protection and higher body as well as structural rigidity without compromising the overall car bodyweight. 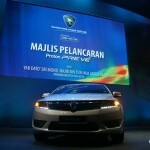 “The Prevé is a very important milestone for PROTON in many ways. 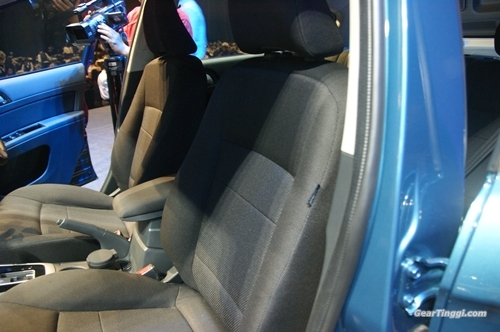 It represents a new and higher level of standard for Proton cars in all aspects encompassing safety, performance, comfort, build quality, technology, overall design and convenience. 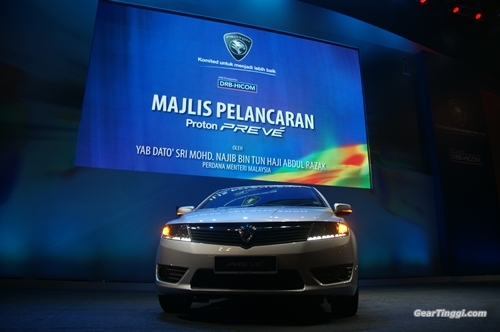 More significantly, it reflects on PROTON’s maturity, technical knowledge and technological capability as a car manufacturer and to evolve from a domestic and regional player into a global car company,” said Dato’ Sri Haji Syed Zainal. 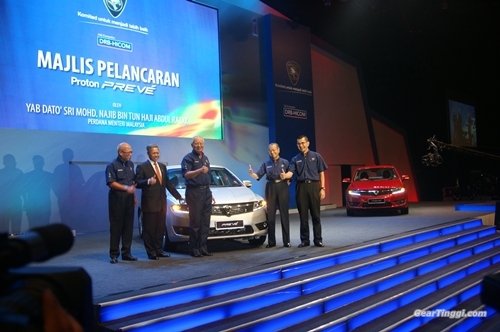 The Prevé is also the first Proton model to receive the five-star Malaysian Vehicle Assessment Programme (MyVAP) rating by the Malaysian Institute of Road Safety (MIROS), with the certificate officially presented to PROTON during the launch event by the Director General of MIROS, Professor Dr Wong Shaw Voon. 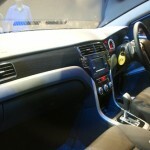 The vehicle is also equipped with a Smart Information Display system (SID)that displays vital information and status updates on the Prevé’s various functions such as average fuel consumption, distance to empty, battery health and faulty bulb indicator, gear shift lock indicator, home lamp indicator, vehicle intrusion warning and many more. The Prevé is equipped with a Push Start button*, LED lights, Electronic Stability Control (ESC), Anti-lock Braking System (ABS), Electronic Brakeforce Distribution (EBD), active headrests, anti-trap power window, four airbags* amongst the many items. (*Only available in the Premium variant). 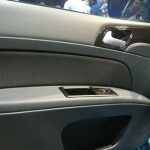 Another unique feature of the car is that it is 4G enabled, courtesy of PROTON’s collaboration with YES 4G. 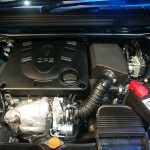 While the Prevé Premium 1.6 CFE is turbo-charged, it has a commendable fuel consumption rating of 6.6 litres/100km (at combine cycle) and a service interval of every 10,000km for a lower cost of ownership. 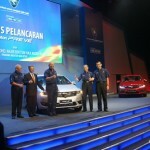 The first five Prevé owners were also recognized during the launch ceremony, where Mohamad Yusof Sudin, Baskaran A/L Subramanian, Nurhani Kasuan, Tan Sri Dr Goh Teck Chai and Noor Ezira Noor Kefli we all presented with the keys to their brand-new Proton Prevé by YAB Dato’ Sri Mohd Najib Tun Abdul Razak. Available in six colour choices: Blue Lagoon, Fire Red, Tranquility Black, Solid White, Genetic Silver and Elegant Brown, the Prevé can be test driven at all Proton authorized showrooms nationwide. 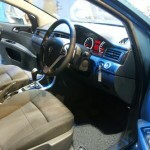 gua pulak yg ke 2…hahahah…..
Yg pasti gua tunggu preve edisi manual CFE nanti. 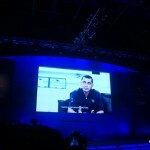 Bkn 3rd tp ke4 der…. 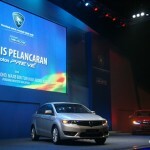 Adakah Proton Preve setanding dengan peugeot 207 model dari segi performancenya. Aku yg ke 8 ker??? 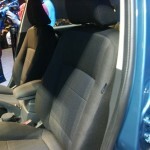 reger dia mencabar kewarasan aku..sib baik x amik vios..baik beli preve’ dari beli vios.hak hak hak..
rasanya proton akan buat jugak ke Manual CFE??? 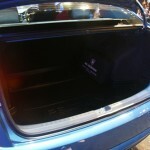 Nanti gua cerita pasal design, coupe atau hatchback, manual CFE dll..
Gua cerita panjang dengan Encik Lan pasal design. Kenapa dan kenapa. Nanti gua story. Apa pun, Coupe memang tak de. Sila kecewa. 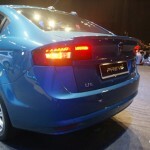 i like Proton Putatan more than Punai..
malaysia tegnologi begitu cun sdh???!!! jangan2 copycat lagi org lain la,mana sudah org yg pro di sini? harga itu macam,ada ka kualiti tak? tenggok la org malaysia napa almost pilih import car ni… walau pun kena tex mahal2,mampu juga org nak beli bah,bukan pasal kaya,tapi… kualiti bah!…diu! err.. CM PUNK .. do you believe in car soul? do you see any soul in Proton? ok .. keep aside patriotism when commenting this.. do you see any soul at all in preve?? i see ghost.. meaning i see this car as normal rides.. nothing special to’soul’ it up.. consumers are like scholars nowadays.. they learn what’s happening around the market and they compare.. 1st time you can fool them.. 2nd time you might fool them.. 3rd time they would fool you back ..